Over the past two and a half years of parenting, there is one thing I have learnt, when travelling with a toddler, carry lots of food and lots of distractions ( read books, toys, coloring books and more toys.) While we are extra cautious about not forgetting the latter, sometimes we buy but forget to pack the perishables at the end. During a recent trip, that is what happened with a bunch of bananas. They simply got forgotten. So we returned home to a bunch of overripe bananas, seeking immediate attention. With Google at service, I soon found a million ways to use those and that is how these Chocolate Banana Cookies came to being. The original recipe is Elise's granny's. Since chocolate makes the good taste divine, and baking healthy is fun, with a little adjustment here and a little there, I upped the old-fashioned banana cookies with a double dose of chocolate, substituted the butter with olive oil, half of the flour with whole wheat flour and the egg with applesauce and we were good to go. 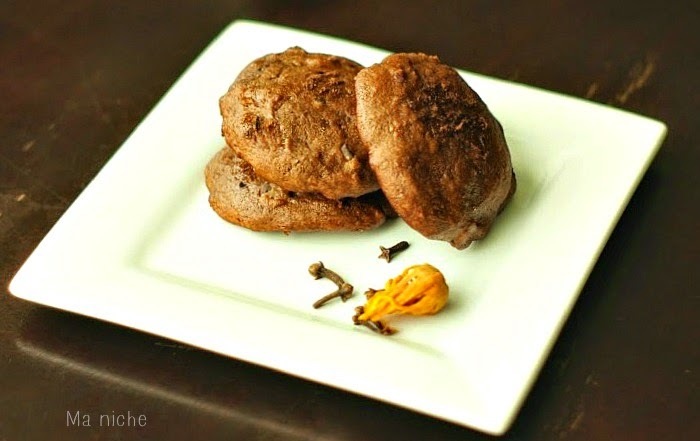 Though I had expected chocolate to take precedence, my favorite thing about these cookies was the spices. The mace did a wonderful job of camouflaging the smell of overripe bananas and the cloves added flavor without overwhelming the taste buds. Overall these cookies were quite a treat and I can see myself baking them quite often. Center a rack and preheat oven to 375 °F. Put olive oil, sugar, mashed bananas and applesauce in a big vessel and using a electric hand mixer beat them for about 3 minutes until a smooth batter is formed. Allow the batter to rest for a couple of minutes. Meanwhile, using a dry grinder, grind the mace and cloves into a fine powder. Sieve the flours, baking soda, cocoa, salt and ground spices into a large mixing bowl. Let the baked cookies rest on the baking tray for 5-10 minutes before removing them. Cool completely before serving. Love chocolate cookies. Yours are filled with healthy ingredients applesauce, banana, wheat flour. A wow combo, !! 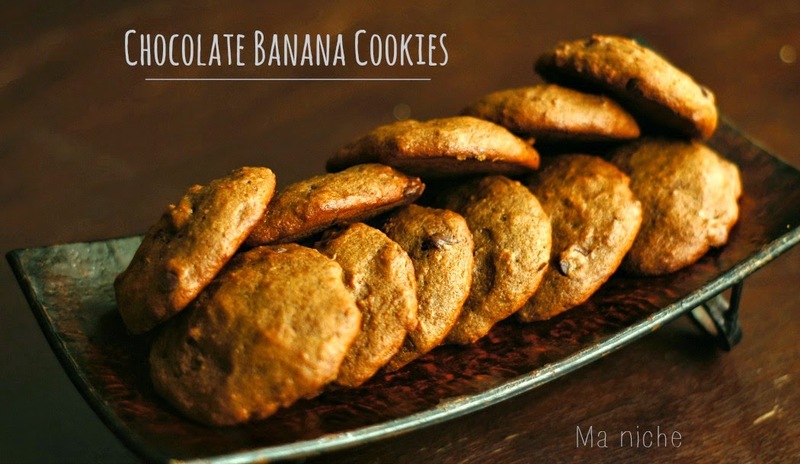 I can only have banana in breads and cookies, adding chocolate definitely gives more flavour..
chocolate banana cookies looks delicious, Thanks for sharing with Hearth and Soul blog hop. Oh my, chocolate and banana two of mine and my family's favorites. Pinned. These look delicious! Thanks so much for sharing with the Let's Get Real Party. 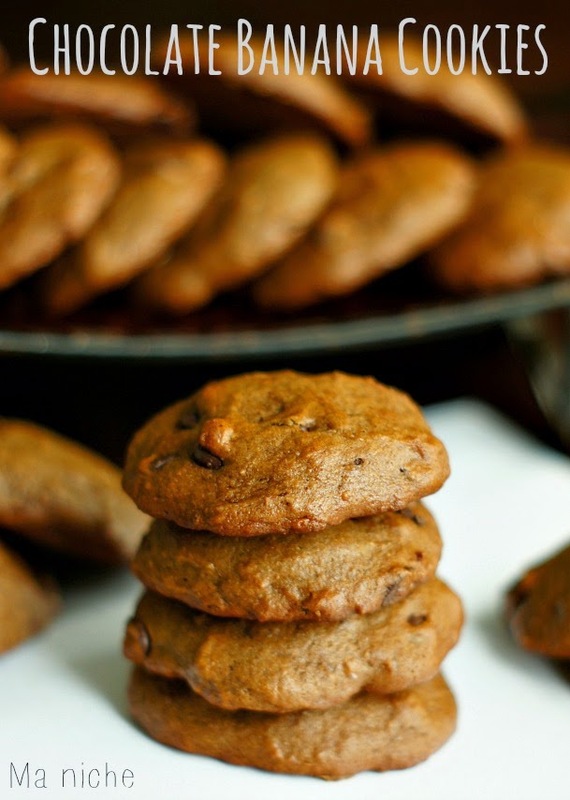 These Cookies need to be in my Cookie Jar! Thanks so much for sharing this awesome recipe with Full Plate Thursday and come back soon! Love these cookies! 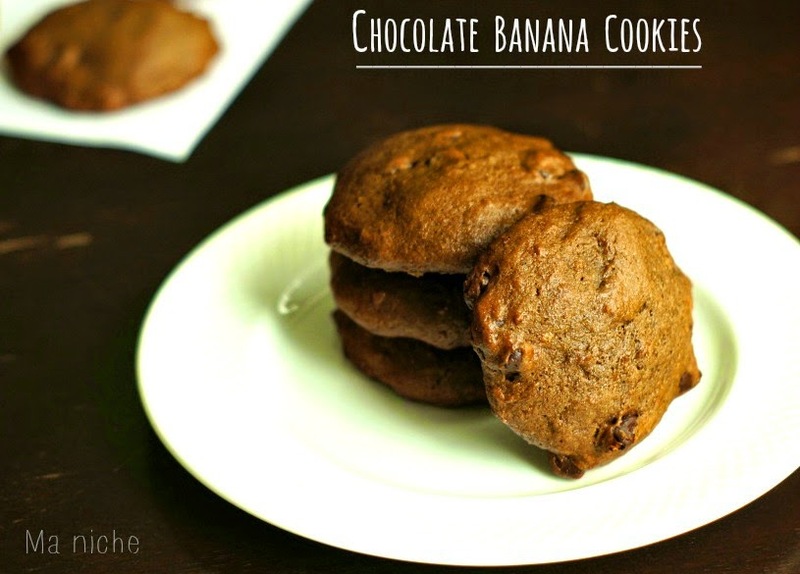 They sound utterly delicious with the chocolate and banana…yummy combo!